"Made to Move" harnesses power of Invisalign brand across both consumer and professional audiences worldwide for the first time. Align Technology, Inc. (NASDAQ: ALGN) has announced a new global brand identity and advertising campaign for the Invisalign® brand. 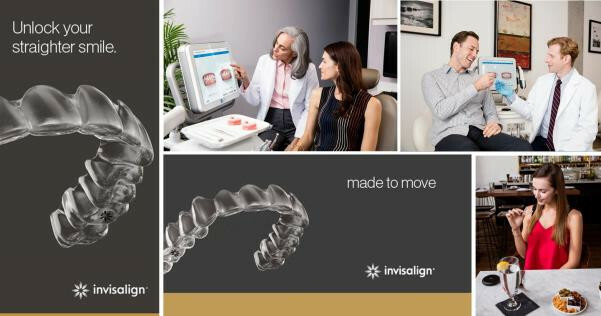 It`s the company's first integrated campaign designed to assert the unique strengths of the Invisalign brand and product, as well as to reinforce Align's commitment to establishing clear aligner therapy as the alternative to traditional braces - the clear choice that over 4 million patients have already made. The Invisalign "Made to move" brand campaign focuses on the innate desire that all people have to move forward and to advance in life, and highlights the powerful role a smile can play in every aspect of life – from professional to social. The new brand identity and campaign was designed to create strong emotional connections with audiences around the world while also bringing Align's digital technology to life in a way that is meaningful to both Invisalign providers and consumers alike. The new brand launches in the UK this week, with an integrated media, PR, social and in-practice campaign. It will then be rolled-out to other European markets over the coming months. The company’s goal is to create a seamless brand experience wherever the Invisalign brand is encountered across the globe, and creates a much broader, deeper awareness of the benefits of treatment with Invisalign clear aligners - the most advanced and recognized clear aligner system in the world. For additional information about the Invisalign system or to find an Invisalign provider in your area, please click here.